If you are looking for a perfect organizer, then you definitely found it here! This Knitting or Crocheting Bag is not only vibrant in color, it's also very well made, and very functional. The 3-in-1 Tote is very convenient for packing your projects when traveling or at home. Definitely a MUST HAVE item in your Crafting Room! BUY NOW and have fun organizing! 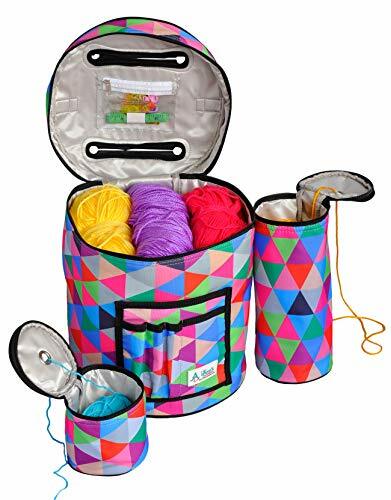 - GREAT VALUE YARN STORAGE ORGANIZER with Extras - It comes with one main storage, fits 4 to 5 large yarn skeins with holes for the yarn at the top,yarn pulls easily, without catching through the eyelets. Clear zippered pocket for your tiny accessories, small, medium, large side pockets for your crochet hooks, knitting needles and other tools. Small pouch with grommet for yarn ball. One big pouch for Crocheting or Knitting Tools and accessories or can fit one large skein yarn or 3 or 4 yarn balls. - CARRY YOUR PROJECT IN STYLE - This Yarn Tote is a perfect container to be able to lug it around and keep your craft organized in one place. Stylish, Compact and Light Yarn Holder will make Knitting and Crocheting FUN on the GO. Handcarry at the plane, on your car or in your RV when camping, and just do what you do best! - By buying our products, YOU are supporting a local small Military Spouse business. KNIT & CROCHET ANYWHERE - Love Knitting and/or Crocheting whenever or wherever you feel like it? This Yarn Project Bag Organizer is perfect to haul wherever life takes you! It is setup perfectly to just pick it up and do your work without having to spread yarn all over the place. - Perfect Bag to carry all your Crocheting and Knitting Tools. Even small accessories have a place for it. Just open the bag and the top cover has a clear pocket to easily access those tiny accessories, such as: yarn needles, stitch markers, tape measure, small scissors, stitch holder, etc. There's also large, medium, and small pockets for crochet hooks, knitting needles, large scissors, rulers, etc. - Knitters and Crocheters Perfect Basket Organizers. 3-in-1 grab and go purse for storing your project. This totes are very functional, high quality, and very well made. Athena's Elements only offers the best quality products.